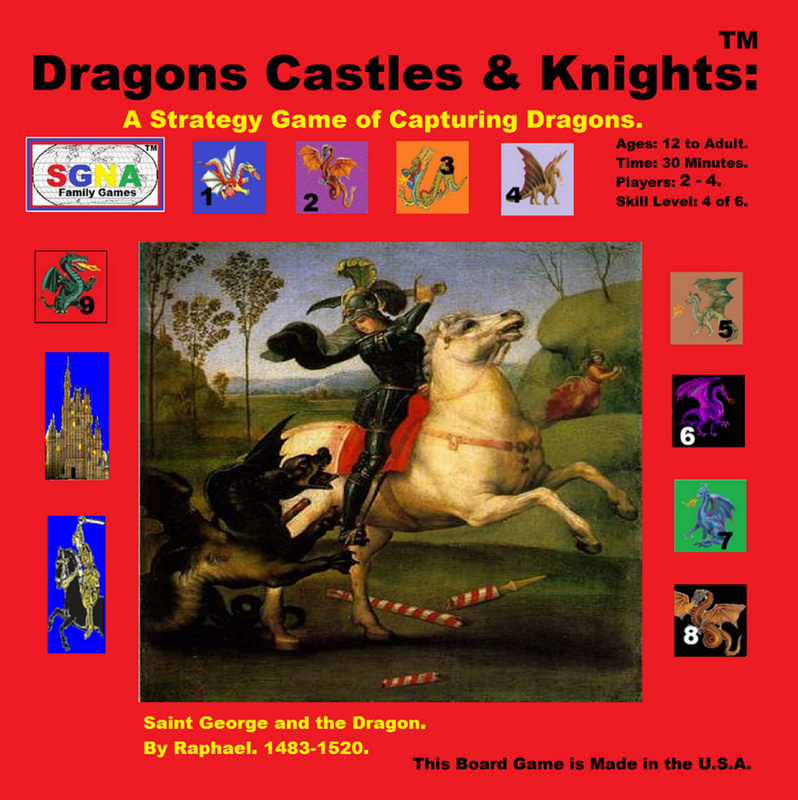 A great Strategy game of capturing Dragons! The first player to get the majority of Points WINS. The ages to play DCK are 12 to adult. DCK is a strategy game played by 2, 3 or 4 people. Playtime for DCK is about 30 minutes. 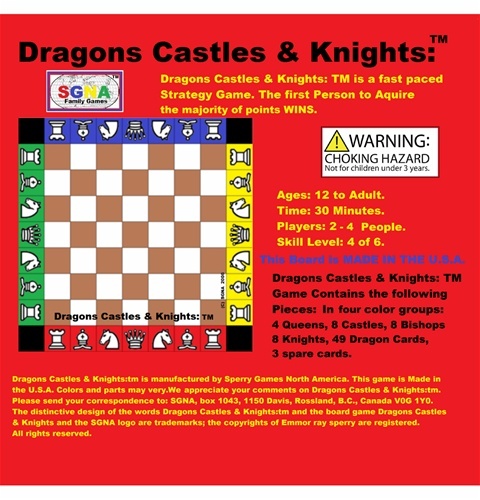 The objective of DRAGONS, CASTLES AND KNIGHTS or DCK is for the players to accumulate dragon points by capturing Dragon cards with the pieces/tokens in their army. Before you start the game, you must attach the stickers to the game pieces. Enclosed is an extra sticker for each piece, in case of loss or application error. DCK is played with RED, BLUE, YELLOW and GREEN stylized chess pieces (no chess pawns) and Dragon cards (colors can vary). Each player at the start of the game receives 1 Queen, 2 Knights, 2 Castles, and 2 Bishops of the same color. DCK is played with 49 Dragon cards. In addition to a picture of a mythical dragon, each card is labeled with the specific number of points it is worth. The points on the cards vary from 1 to 9 points and the number of each cards are as follows: 7 x 1 point, 7 x 2 points, 5 x 3 points, 5 x 4 points, 5 x 5 points, 5 x 6 points, 5 x 7 points, 5 x 8 points, 5 x 9 points. The total number of points for all 49 cards is 231 points. QUEEN: A queen may move any number of spaces horizontally, vertically or diagonally in order to capture a dragon, capture an opponent’s piece, or to make a strategy move; as long as it is a straight run without any cards or pieces between the start and the finish of the move. CASTLE: A castle may move any number of spaces forward or backward either horizontally or vertically in order to capture a dragon, capture a piece of the other players, or to make a strategy move; as long as it is a straight run without any cards or pieces between the start and the finish of the move. BISHOP: A bishop may move any number of spaces diagonally (forward or backward) in order to capture a dragon, capture an opponent’s piece, or to make a strategy move; as long as it is a straight run without any cards or pieces between the start and the finish of the move. KNIGHT: A knight may move in any "L" shape on the playing board. A knight may move one square up and two squares to the right or left, or a knight may move two squares up and one square to the right or left and they may move in any direction on the board. A knight may jump over other pieces and pawns during a move, in order to land on an empty square, to capture an opponent’s piece, or to capture a dragon. The maximum tokens a player can loose by attack in a game is 6. A players last token on the board, can not be attacked. A player can not attack an opponent on his first move of the game. Game play moves to the left of the first player. If 3 or 4 people are playing; the player on the right hand side of the first player gets to make the last move of the game. If 2 people are playing; the start up squares/spots of players 3 & 4 are out of bounds. The black corner squares of the game board are out of bounds. If 3 people are playing; the start up squares of player 4 are out of bounds. If 2 people are playing the first player to acquire 116 points WINS. If 3 people are playing and one of the players acquirers 78 points; this player can then [if he wishes] call an end to the game, but the game continues until the player to the right of the first player finishes his turn and then the player with the most points WINS. If 4 people are playing and one of the players acquirers 58 points; this player can then [if he wishes] call an end to the game, but the game continues until the player to the right of the first player finishes his turn and then the player with the most points WINS. If the game is played until all the dragon cards are off the game board; the player with the most points WINS. A players point score must always be available to all the players that wish to know it. Each player place the 7 token pieces, in the proper order, on the playing board. Blue on blue and red on red etc. Shuffle the 49 Dragon cards and randomly place them (one on each square) on the remaining 49 squares. Pick a person to be the first player. The game is now ready to begin. Using the moves specified above, you can capture any of your opponent’s pieces except his last token. Once a piece is captured it is removed from the game board. The reason for capturing an opponent’s piece is because the less pieces your opponent has the more difficult it will be for them to accumulate points. However, since capturing an opponent’s piece counts as a move, be selective in your attacks. When a player lands one of their pieces on a square that is occupied by a Dragon card, the Dragon card is removed from the playing board and is considered slain or captured by the player. The number on the Dragon card is added to the player’s points and the player’s piece remains on the square. If 2 people are playing; the first person to reach 116 points WINS.